The project is located in the North Eastern Wheatbelt of Western Australia, from Kalannie to Mullewa. This is a low rainfall zone (<350mm/year) and as such, the farming community is particularly vulnerable to climate change. The purpose of this project is to provide farmers with an option to use sandalwood to diversify their on-farm activities. The project aims to provide an information and extension service on the use of best management practices for incorporating sandalwood into the farm business. This will include workshops from industry professionals, field trips to sites in similar rainfall zones in the Avon catchment and the chance to talk with existing growers there to find out what they have done. The project will also provide subsidised membership to the Australian Sandalwood Network (ASN), which will allow access to the ASN’s peer mentoring scheme. The project overall will address the barriers to incorporating sandalwood into a farming system. As part of the project, we will also set up a demonstration site, with advice from industry professionals. 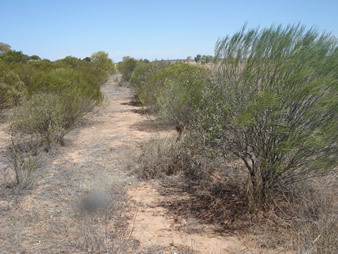 Most successful sandalwood plantations in the WA Southwest use jam wattle (Acacia acuminata) as the principal or exclusive host. In local remnant vegetation patches, however, we have observed that sandalwood forms parasitic associations with many small trees/large shrubs, including numerous species of Acacia, Hakea and Grevillea. Our demonstration site will mirror this diversity. We will identify and collect seed from actual local hosts. In this way we hope to emphasise biodiversity aspects of the project. Can sandalwood be grown at all in this region under domestic conditions? Which elements of the loca flora can act as successful hosts under these conditions? 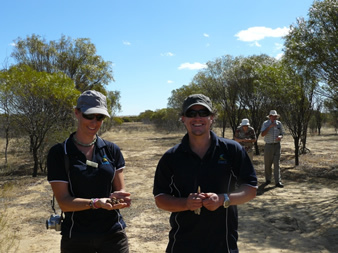 The project aims to provide landholders with information to increase their understanding of the sandalwood industry and allow them to make informed decisions of whether sandalwood is a suitable option to incorporate into the farm business to help develop a more resilient farming system, with associated economic and environmental benefits. Subsidised membership to the Australian Sandalwood Network, allowing access to the peer mentoring system which enables individual advice to all members. Botanical surveys of local remnant vegetation to find suitable local host species, collecting seed and setting up a 5 ha demonstration site with a large diversity of potential host species. These hosts can also be used as a future seed source. Demonstration site monitored and any findings will be made widely available through the newsletters of the YYCMG and Moore Catchment Council (MCC) and other media outlets. The demonstration site will be used in future field days beyond the length of the project.